Hong Kong creative agency Brew recently published a free mobile app landing page named Takeoff. It’s based on the landing page for Google Primer which uses custom animations and fixed scrolling. Takeoff is a great free-range non-dependency template which gained some notoriety on Product Hunt. Notably the animations are key for this design because they truly replicate Primer’s webpage. You’ll find CSS styles for everything from call-to-action buttons and logo placements. Page typography is also custom-styled and there’s a free iPhone UI preview for mobile app developers. 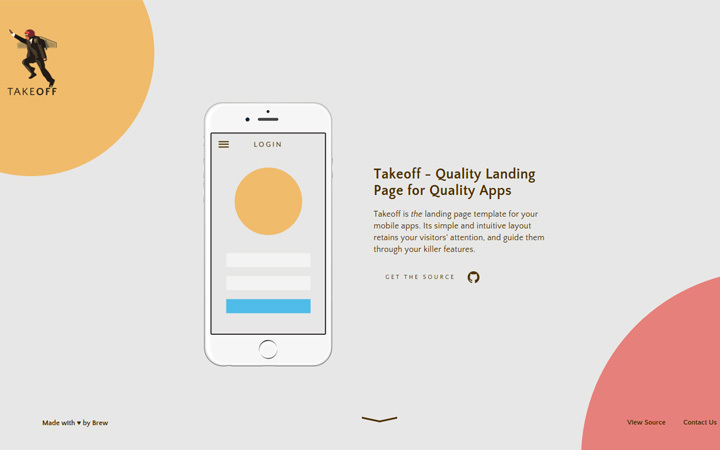 If you’re building a mobile app or designing an app landing page check out Takeoff and see what you think. It’s highly customizable and fits well with any digital product.